HP's drastic corporate overhaul may have scared investors, but has the backing of controversial former CEO Carly Fiorina. PALO ALTO, Calif. ( TheStreet) -- HP's ( HPQ - Get Report) CEO Leo Apotheker may have sent investors fleeing for cover with his pile of shocking announcements last week, but former boss Carly Fiorina agreed Monday that drastic action was needed. "The board, the CEO and the management team are doing what they should, and that's to focus on the future," said Fiorina, in an interview with CNBC. "To me, it looks like a bet on the future -- that's what a CEO and a management team should do." Former HP CEO Carly Fiorina. Fiorina added that, with weakening demand in the low-margin PC market, HP is wise to focus on more profitable areas that revolve around software and services in the enterprise market. "They have made a judgement that the nature of that PC business is changing," she said. "Now they are doubling down on software in the enterprise and their presence in the enterprise." HP shares plunged 20% on Friday as investors balked at the company's slew of strategic changes, which were announced with the company's lukewarm third-quarter results. In addition to a possible PC spin off, HP is also ditching its WebOS hardware, which includes the TouchPad tablet and Veer smartphone. The company also confirmed that it is spending a massive $11 billion to acquire U.K. software company Autonomy, a price tag that further spooked investors. Speaking during her interview with CNBC, Fiorina acknowledged that the timing of HP's announcements left a little to be desired. It was probably "not ideal" to turn on the fire hose in the midst of a "terrible week" for the economy, she said. Fiorina was ousted from HP in 2005 over differences in strategy with the company's board, but remains a keen observer of the tech giant. Earlier this month, for example, she urged HP to re-invest in innovation. During Monday's TV interview, Fiorina hammered the importance of communication for HP, explaining that Apotheker and his team now need to make sure the "hows" and "whys" of their corporate overhaul are well understood and heard by investors. 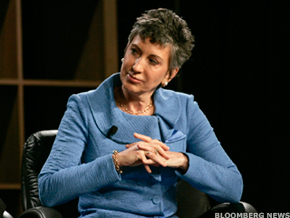 During her HP tenure, Fiorina oversaw the firm's $25 billion merger with PC maker Compaq. Fiorina, however, denied the suggestion that this led to her departure from the tech giant when quizzed about the deal on Monday. "I left the company because there was dysfunction in the boardroom," she told CNBC, adding that Compaq helped HP gain the No. 1 spot in the PC market. "The merger was an unqualified success." HP, she added, has a "deep reserve" of expertise in completing very complex transactions, pointing to its spin out of electronics manufacturer Agilent Technologies in 1999 and the Compaq purchase in 2002. Shares of HP regained some of their lost ground on Monday, rising 4.19%, to $24.59.